The essential company data and information you need to make smarter investment decisions. Power your investment decisions with best-of-breed content, industry-leading support, and flexible data delivery options. When you need to uncover hidden opportunities and risks wherever they may be, FactSet offers the expansive company data to help you make smarter investment decisions. 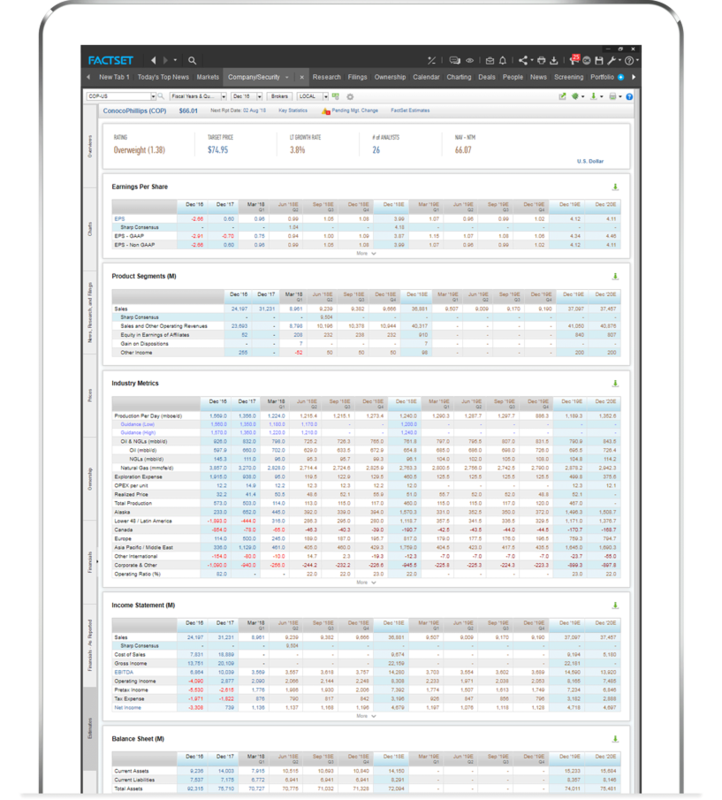 Whether you want to gain a complete understanding of a company's credit strength and overall debt profile, or individual equity components, FactSet helps you understand a company’s true investment potential. Gain access to extensive information concerning U.S. public and private banks using SEC and regulatory financial data from the U.S. Federal Reserve, FFIEC, and FDIC. Our data covers detailed line items for thousands of public and private banks, thrifts, and depository institutions. 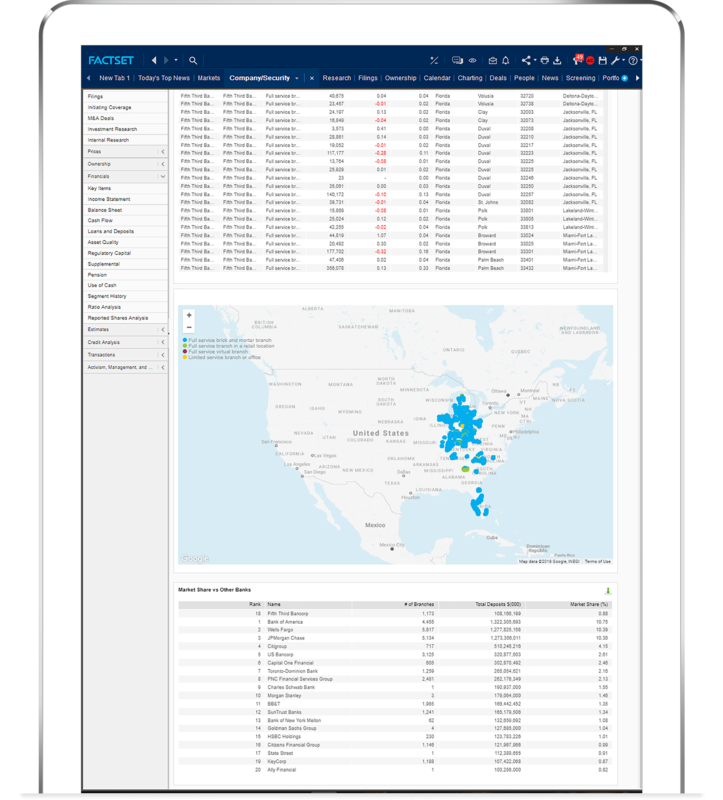 Analyze and compare performance on hundreds of metrics including profitability, capital adequacy, loan/deposit composition, asset quality, and more. Leverage FactSet’s vast selection of proprietary content sets to gain a complete understanding of a bank, including its financial performance, governance, ownership, and capital structure. In addition, our aggregated regulatory branch data from the FDIC allows you to evaluate U.S. bank branches, including their deposit market share, market share concentration, and branch locations. Gain a complete understanding of a company's credit and debt profile. 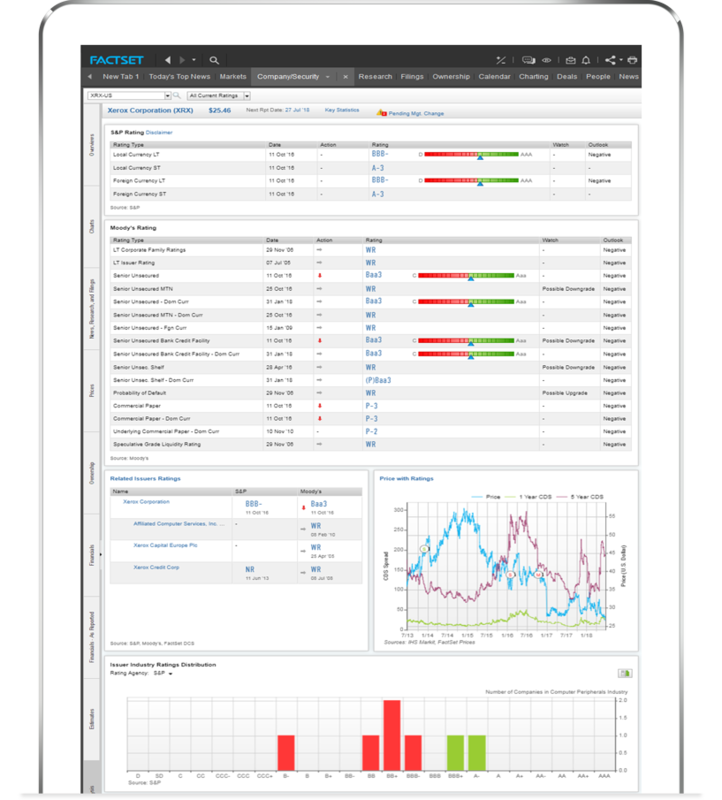 Access timely terms and conditions data on a global universe of securities with prices and derived analytics from FactSet’s industry leading fixed income calculation engine. Analytics coverage includes corporate, government, agency, municipal, and structured product instruments. Get the latest information on credit strength and an overall debt profile for corporate issuers. Thoroughly examine a company’s sources of debt. Access public and private company debt financing and analyze debt at the individual instrument level. Collected from financial statements, credit agreements and indentures, Debt Capital Structure (DCS) provides summary and detailed information on the debt structure of over 50,000 reporting entities globally. By capturing revolving credit (balances and availability), term loans, notes, bonds, and other borrowings as of a specific fiscal date, you can thoroughly analyze the debt listed on an entity’s balance sheet. Analyze a company’s capital structure and view individual equity components. Examine a company’s individual equity components to determine the enterprise value and the potential dilution of a company. You can access information on a company’s convertible securities, options, restricted stock, and warrants used to determine dilution and enterprise value. 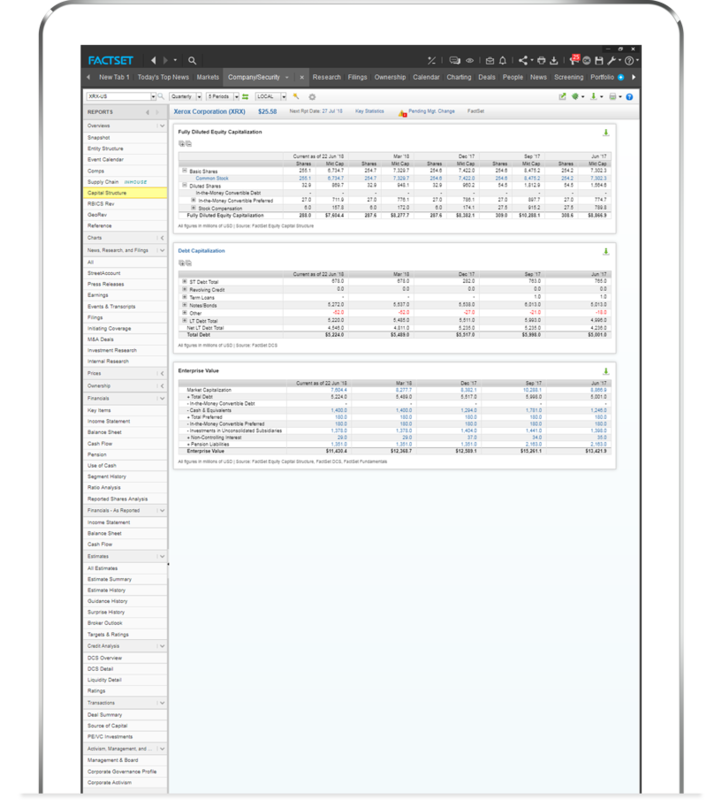 Sourced from company financials, Equity Capital Structure Data includes data from FactSet’s Debt Capital Structure, Options and Warrants, Share Repurchases, and Terms and Conditions databases for each company as of a specific fiscal reporting date. Understand today's market with consensus and detail estimates. Review comprehensive consensus- and detail-level estimates and statistics directly from the research reports of over 800 contributors, including leading research firms and investment banks, across 55 countries. Updated intraday, consensus estimates cover the markets of 90 countries, providing comprehensive consensus estimates and statistics for 19,000 active companies and over 20 years of history. Updated daily, detail estimates provide individual broker-level estimates collected from over 800 sell-side analysts. This database contains over 20 years of consensus history for 200 estimate items across 19,000 active global companies. Lear more about how you can contribute data. 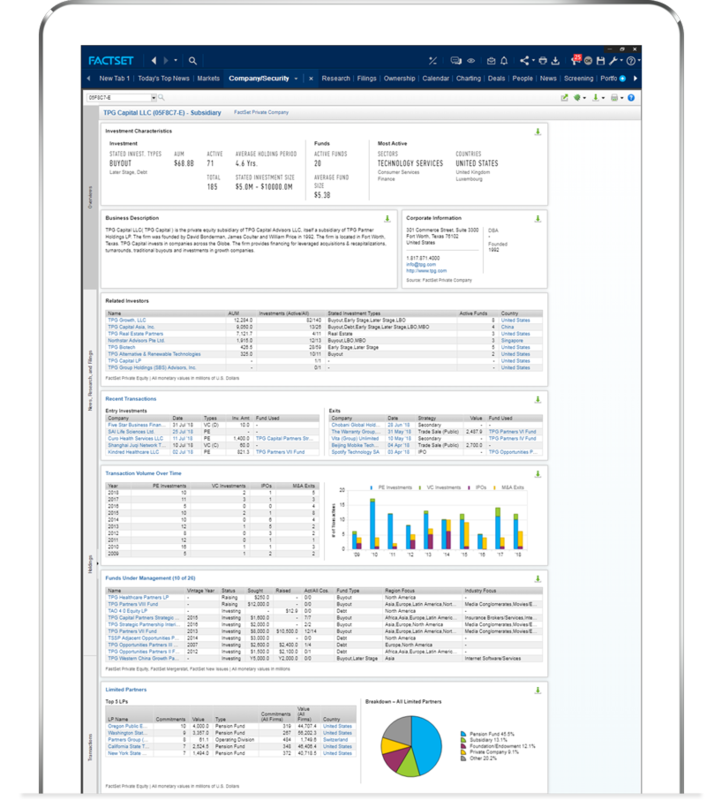 Find and analyze company filings and evaluate earnings guidance, management direction, and compensation practices. 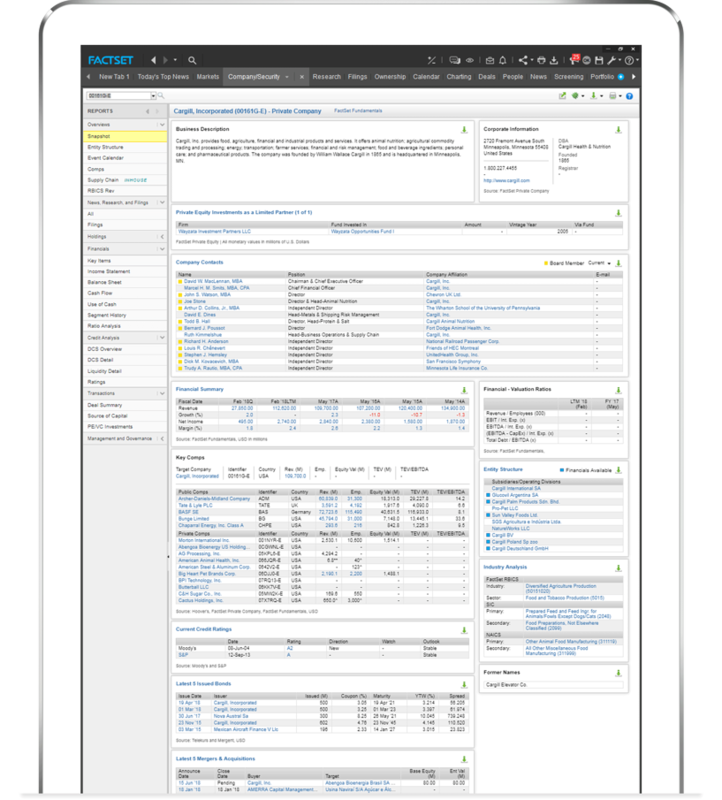 Quickly find and analyze company filings. Locate annuals, interims, prospectuses, M&A, corporate releases, proxies, exhibits, and ownership filings across a wide range of global companies. 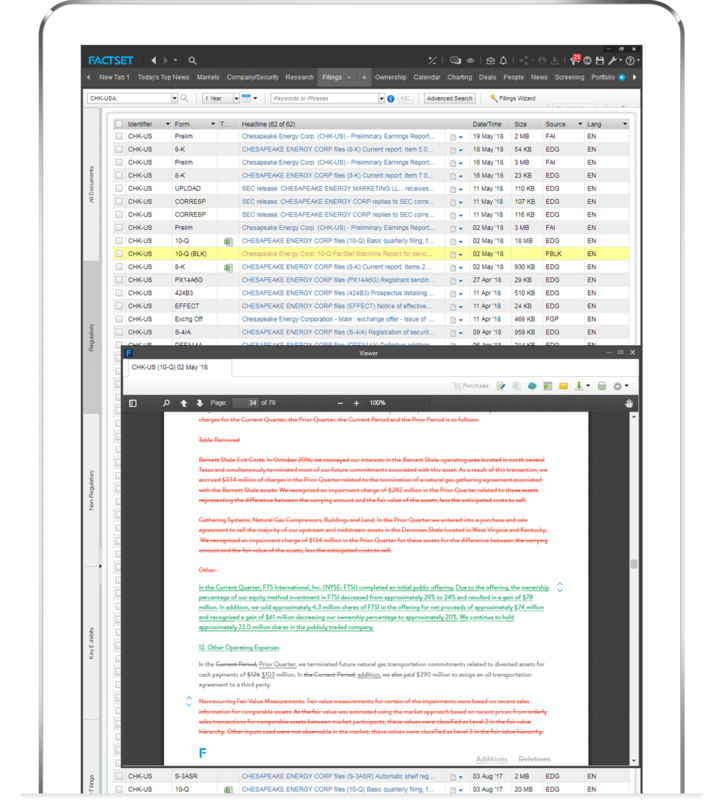 Save time with advanced searching capabilities that allow you to quickly narrow down results based on given detailed parameters and a document viewer that allows you to view related content side by side, including exhibits, call and conference transcripts, FactSet Blackline reports, and registration threads. Log in to FactSet Filings. Track the changes and relationships between public or private companies and their operating subsidiaries. 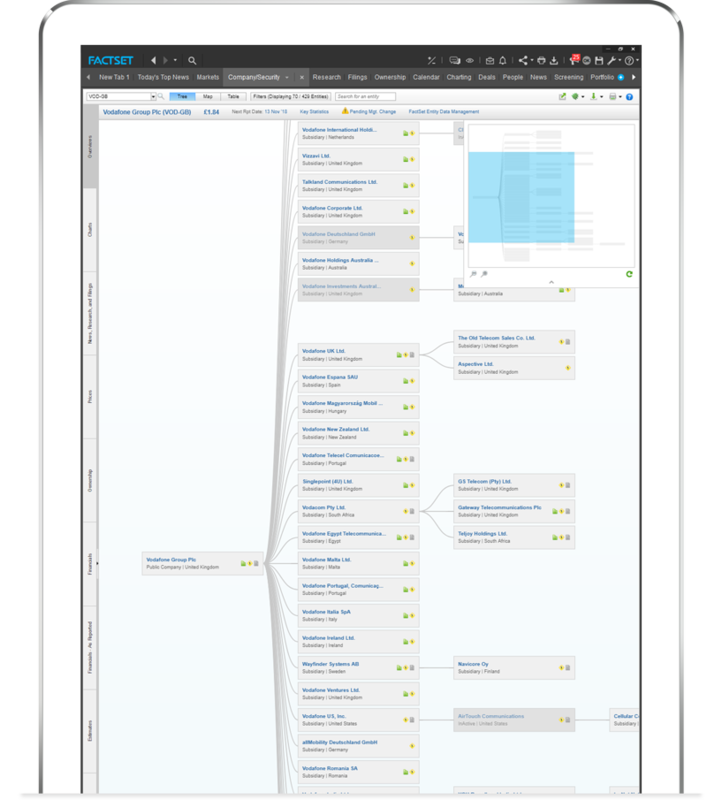 FactSet's financial entities data tracks the changes and relationships between public or private companies and their operating subsidiaries, equity and fixed income securities, company officers and directors, analysts, money managers, and more. Industry-specific metrics covering almost 1,000 data items. Access current, comprehensive, and comparative information on securities in worldwide developed and emerging markets. Composed of annual and interim/quarterly data, fundamentals data includes financial statement data, per share data, derived ratios, and business and geographic segments. Intraday updates from press releases for more than 100 key items ensure that you are using the timeliest data available. 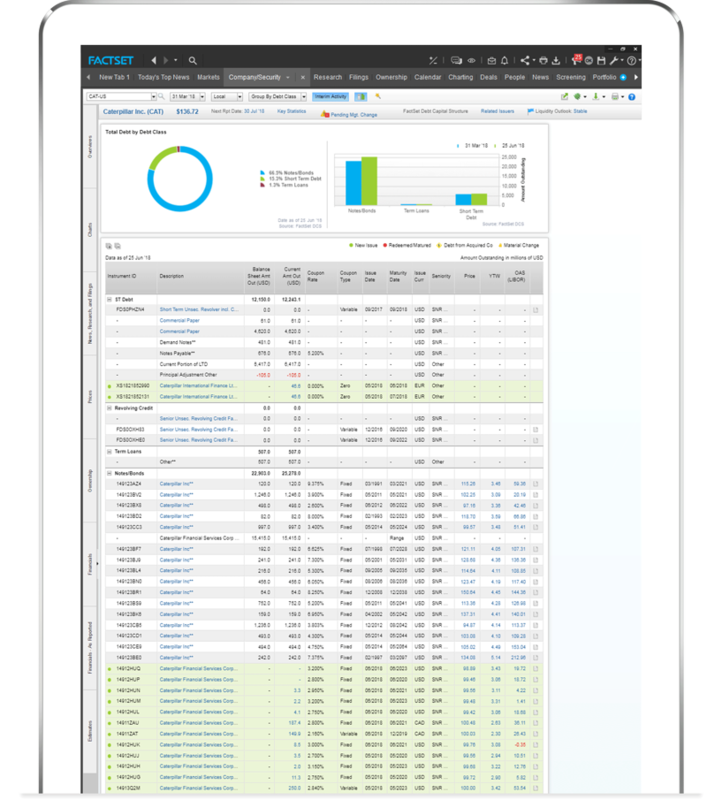 Portfolio details from thousands of databases on a single platform. 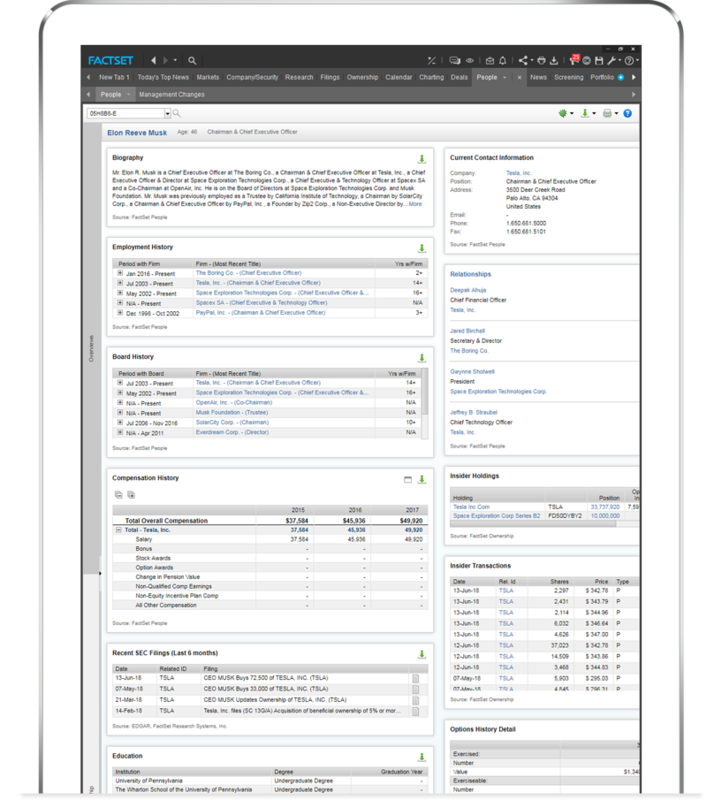 The FactSet Funds database integrates portfolio details from thousands of databases, including equity, fixed income, pooled, segregated, private, money market, UCITS, fund of funds, master funds, exchange traded funds, exchange traded notes, and exchange traded commodities data, on a single platform to offer a comprehensive workflow solution for publishing data. 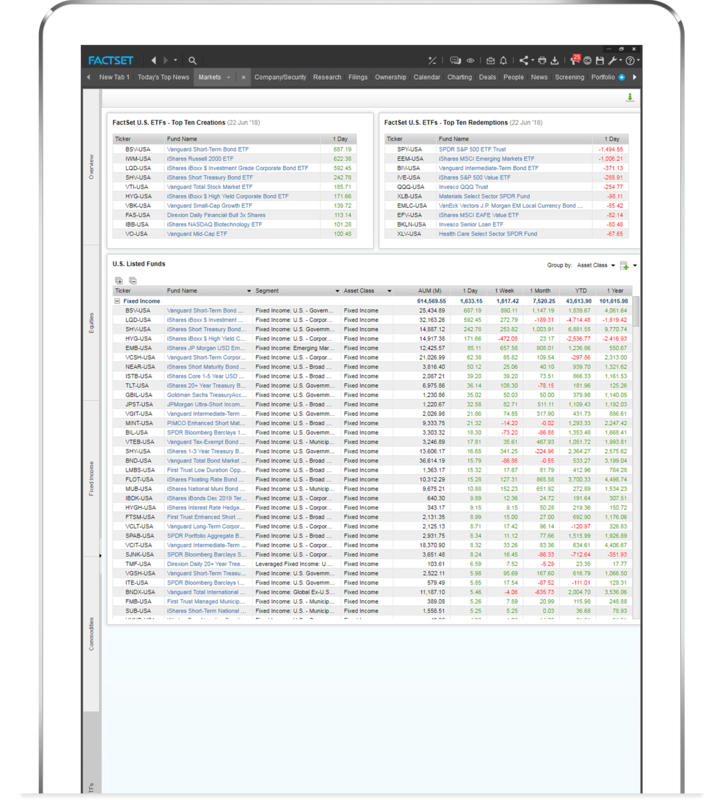 FactSet Funds data is an ideal distribution channel to market your fund information directly to more than 88,000 FactSet users, including wealth managers, fund of funds, pension funds, and sovereign funds. 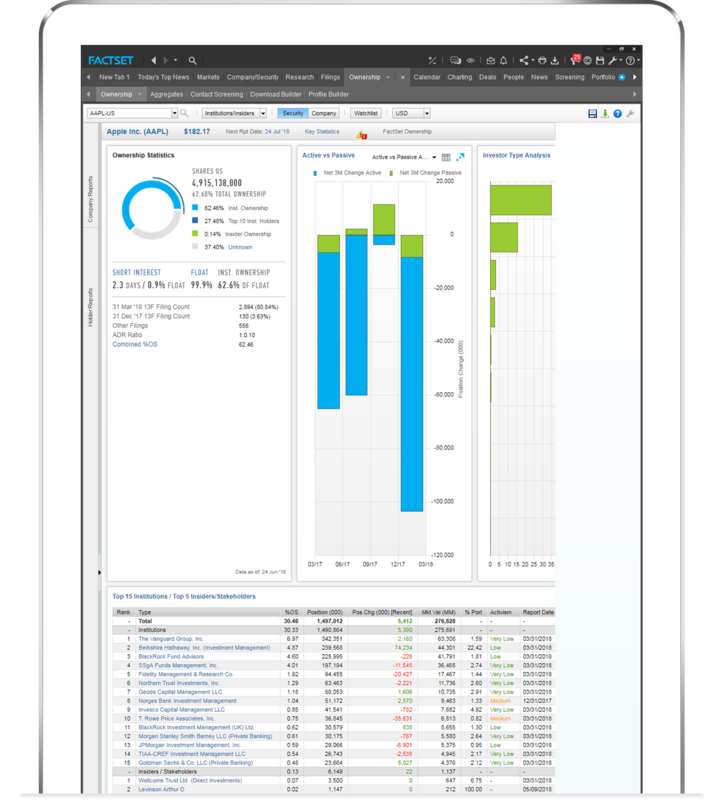 FactSet publishes and disseminates fund data provided by major fund managers in more than 75 countries. 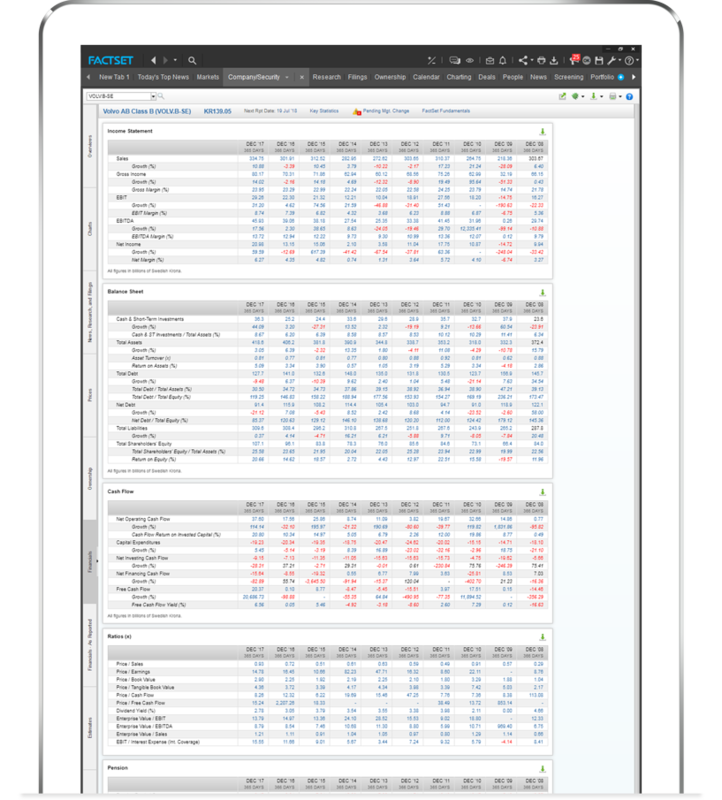 The information is fully integrated into FactSet applications, letting users easily select the data they want to see and quickly run their own analysis and selection process based on the allocation of funds. Share ownership information for equities and fixed income securities worldwide. 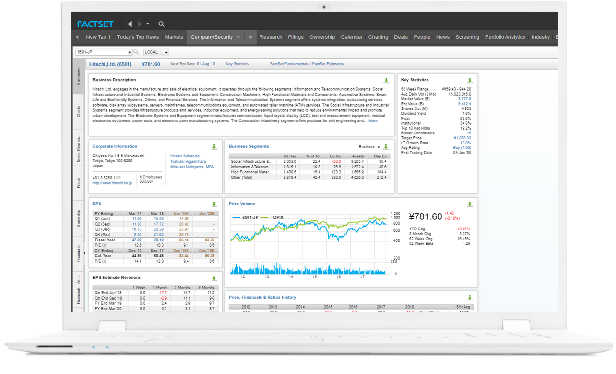 Analyze holdings to identify institutional, mutual fund, insider/stakeholders, and float-related share ownership data and information for equities and fixed income securities worldwide from company and institutional filings, investor reports, and press releases. Updated daily, this database provides more than 17 years of history across 120 countries and offers unadjusted history for quantitatively-focused users. Personal and professional information for individuals associated with public and private companies. Review personal and professional information for approximately 2.2 million individuals associated with more than 835,000 firms, including public and private companies and financial sponsors, as well as private equity firms and investment professionals. Information includes active and historical employment, board positions, and job details. Use this information to identify relationships based on shared employer and tenure, board history, or educational background. More than 40 private company data items, including rounds or securities invested, management and board members, financial data, and employee counts. Discover details on millions of private companies, including SEC filers, private companies with public debt, companies involved in M&A transactions, and private equity and venture-capital-backed companies. Review financing rounds or securities invested and investment date, plus in-depth analysis of the deal with links to sources, board seats, and percent held. In addition, entity maps provide links to subsidiaries and parents of private companies. Our private company data includes business descriptions, company contacts, industry data, management and board information, financials, and transactions via M&A. Detailed information on global private equity and venture capital firms. Get comprehensive information on thousands of global private equity and venture capital firms. You can access information about a firm’s venture capital financing rounds, view in-depth company profiles and investment trends, analyze industry and geographic holdings, as well as discover potential investments. View the funds managed by each private equity or venture capital firm, including details on fund open date, status, amount sought and amount raised. Access the latest pending M&A deals by buyer or seller, management and board, industry and geographic areas of focus, and investment approach overview.